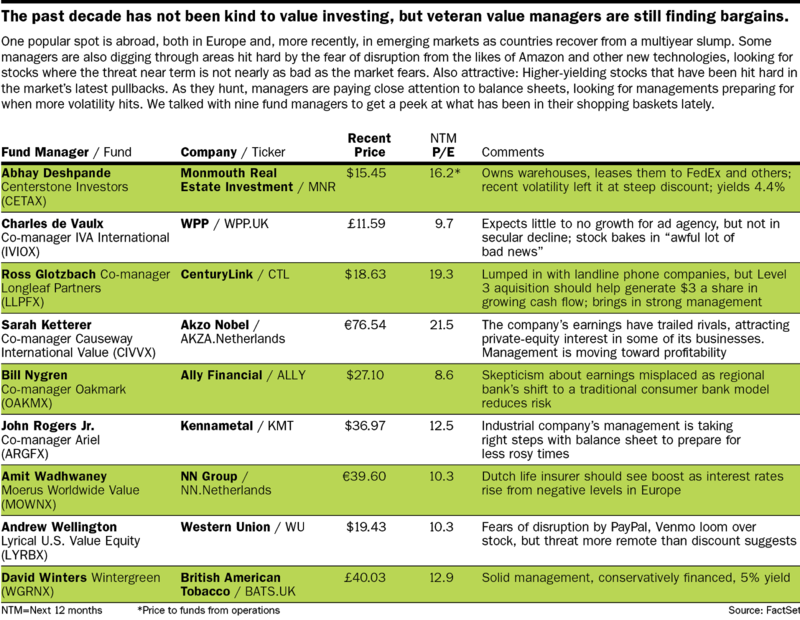 Are Value Stocks Ready to Grow Again? Quick: Name a famous investor. Whether you thought of a celebrity like Warren Buffett, a less famous (but no less successful) hedge fund manager like Seth Klarman, or reached into the past for the likes of John Templeton or even Benjamin Graham, you have very likely named a value investor. Value investors are known for their academic nature, their patience, and their ability to diverge from the Wall Street groupthink. But most of all, they are known. This venerated group of investors, however, has been having a tough time. Granted, looking foolish is often part of the job description, since the most exciting times in the market—the go-go ’80s, the dot-com ’90s, the perversely bullish teens—are all about growth. After two, maybe three years, investors who stubbornly refused to overpay for skyrocketing stocks, recover. Usually. But for seven of the past 11 years, value stocks, and many of the people who own them, have languished. It’s getting tiresome even for those famous for their patience. Value investing should work. 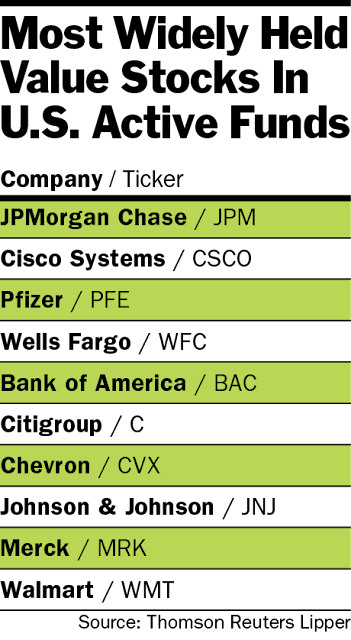 At its most basic, it’s buying stocks that are cheap and holding them until the rest of the market realizes these great companies are selling at a bargain price, and pile in, driving prices up. Endless research has been done on the so-called value factor; the most well known was published by economists Eugene Fama and Kenneth French. Using decades of data, the duo posited in 1992 that value—buying the cheapest stocks and selling the priciest—was one of three factors contributing to outperformance. Over the long term, that has generally been true. But since 2006, growth stocks—shares of companies whose earnings are growing at an above-average rate—have outpaced value stocks, especially in the U.S. This has caused consternation and speculation: Is value dead? Not by a long shot. Three factors are at work, according to value managers. First, there are signs that the market will soon turn in value’s favor. Changes in the market and the rise of passive investing have made active management all the more important. And some of the classic measures of value aren’t working as well—which could lead to a broadly different definition of value itself. “This time it’s different” has long been a rallying cry of growth investors who dismiss traditional ways of evaluating stocks, like during the dot-com boom when “price-to-eyeballs” became a thing. But inside GMO, the $71 billion asset manager co-founded by Jeremy Grantham, managers have been debating the dangers of always assuming that things are never different. That has led them to question whether mean reversion (the tendency of prices to move back to historical averages over time) is the inevitable outcome it’s thought to be and whether stocks could stay at higher-than-average prices. “That was a significant concession,” says Matthew Kadnar, member of GMO’s asset-allocation team. To be fair, value stocks have had a good run, just not quite as good as growth stocks. 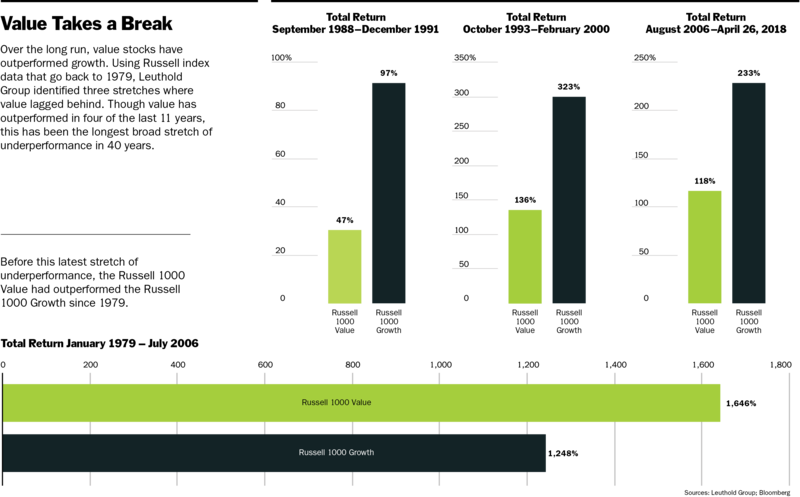 Over the past decade, the Russell 1000 Value index has returned 102%—not too shabby, but significantly less than the 178% for the Russell 1000 Growth, and behind the broader market’s 137% return. Many of the conditions holding value back are temporary. When the Federal Reserve began its quantitative easing to expand the money supply, bond yields came down, stock prices went up, and investors became less and less discerning as the market rose. Plus, anemic economic growth meant that investors were willing to pay up for the companies that were growing: While value stocks’ earnings have risen just 23% over the past decade, growth stocks have risen 44%, according to Leuthold Group. All of that made for an inhospitable backdrop for bargain hunters who favor companies with strong balance sheets and low price tags. But that’s starting to change. As Thomas Lee at FundStrat Global Advisors notes, it has been “several generations” since we’ve seen stocks with price/earnings ratios this low this late in a bull market, which bodes especially well for low-P/E value stocks. Value stocks are trading at 13.5 times forward earnings; the FANG stocks— Facebook (FB), Amazon.com (AMZN), Netflix (NFLX), and Alphabet’s Google (GOOGL)—are trading at nearly double that, though a still surprisingly low 24 times, Lee wrote in a note last week. 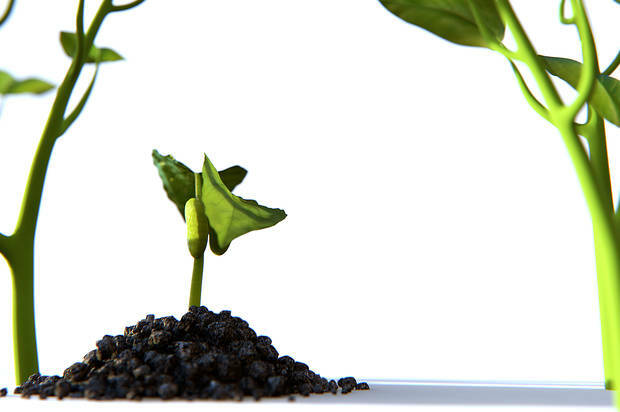 The rise of index investing has simplified the definition of value to a series of rules or metrics that can be used to create an index—a process that runs counter to the style’s roots. Value investing has a nearly 100-year history rich in academic research and big personalities running distinct portfolios. Benjamin Graham and David Dodd are credited with creating the value discipline in the 1920s, with tenets like buying stocks with a “margin of safety” to buffer unexpected developments. This created a lineage: Graham mentored Warren Buffett, who made a career of finding companies trading below their intrinsic value. Buffett, of course, has inspired countless disciples, such as Mohnish Pabrai, Prem Watsa, Bill Nygren, and a host of other hedge fund and mutual fund managers who have put their own spin on value. Some managers still use a deep-value approach, buying companies that investors have abandoned because of management or other business problems. Some, like Buffett, have gravitated toward great businesses at a “fair” price, but others will sit on cash if they can’t find anything cheap enough. Definitions of cheap vary, as do the processes used to determine “cheap”: Some managers use a flexible mosaic of factors; others stick with a more rigid statistical approach, focusing on metrics like price-to-earnings or price-to-book. But there’s a problem with price/book: today’s economy. Price/book, perhaps the most conventional measure of value, evaluates stock prices based on a company’s book value—the worth of all tangible assets but no intangible ones. Price/book and similar accounting-based metrics worked better in an industrial-based economy, when companies owned valuable tangible assets, like manufacturing plants and equipment. Today’s service economy is filled with companies whose biggest assets are their brands, intellectual property, or customer loyalty, which don’t show up on the balance sheet. Other trends, like stock buybacks, also skew the view from these metrics: On a balance sheet, buybacks can create negative shareholder equity, which can look like a sign of distress, says GMO’s Kadnar, who rebuilds balance sheets to make sense of what he sees as outdated accounting. French has heard all of this before. The finance professor at Dartmouth College’s Tuck School of Business, whose work with Fama helped make price/book a classic gauge for value, maintains that price/book is still the best measure of value. “We have tested the hypothesis several times since then and haven’t been able to convince ourselves that another measure—including a combination of measures—is better, especially after we consider the effect on portfolio turnover,” French wrote Barron’s in an email. Whether or not price/book is relevant, its effect on the index is undeniable and the reason that many active managers point to problems with the index. That may sound self-serving, but there’s merit to their argument: The Russell value indexes—the benchmark for $3.1 trillion in fund assets—are heavily weighted toward price/book, which makes up half of the calculation. Tom Goodwin, FTSE Russell’s senior research director, says the intention is to match the return patterns of self-described value active managers, which he says is captured by the index’s calculations. But the emphasis on price/book has caused the index to underperform, and that’s one reason people think value overall hasn’t done well, says Ronen Israel, a principal at AQR. Nygren isn’t alone, and Greenwald says the shift in the economy warrants a more flexible approach: Service-oriented businesses tend to require higher market share to dominate, creating more monopolistic companies, with steadier and higher profits that could warrant higher multiples. 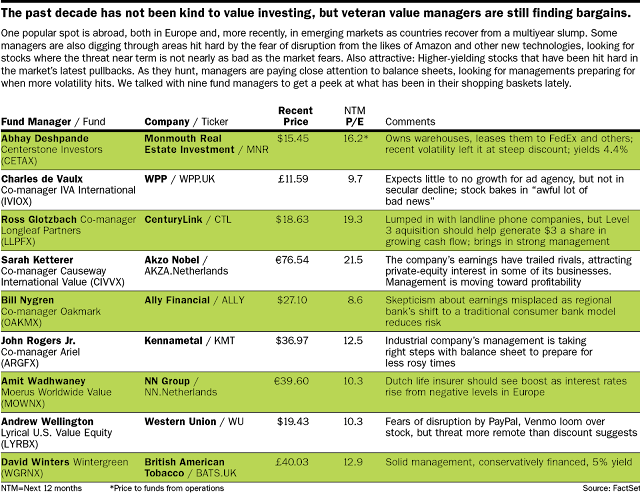 Alec Lucas, senior analyst at Morningstar, points out that so many value managers have started buying what were traditionally considered to be growth companies that many value funds now pop up in Morningstar’s “blend” category. That willingness to own some nontraditional value stocks is one reason three-quarters of U.S. large-company value funds beat their benchmark last year, and 63% outperformed in the first quarter, a higher rate in both periods than growth managers. Is this a turning point? The setup for value is certainly improving. Historically, value does better than growth when profits are accelerating, as they are now. Deregulation and tax cuts should boost sectors heavily represented in value indexes, like financials, industrials, and energy. The gap between the cheapest and priciest stocks has also widened since last year, providing an incentive for investors to look for cheaper options, Ketterer says. 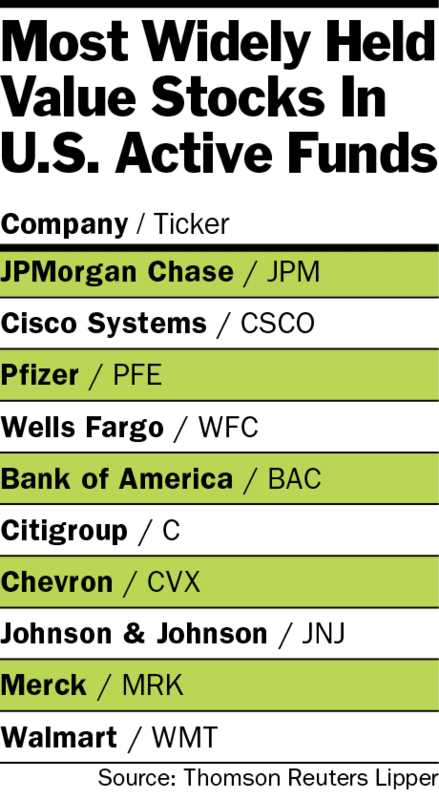 Value’s recovery may be as delayed as spring’s arrival in the Northeast, but the green shoots are starting: Value stocks outperformed the broad market by 1.4 percentage points this past week, the best week for value stocks in more than a year. If nothing else, investors seem to be tiring of paying up for, well, not much. The S&P 500 Consumer Staples Sector Index, for instance, ended 2017 trading at a whopping 19.8 times 12-month earnings estimates, above the S&P 500’s 18.2 times, despite expectations that its sales would grow at a rate that is half that of the S&P 500 as a whole. Staples have tumbled 11% since then—the S&P 500 is close to flat—and while that might not be a sign that investors will suddenly rush into value stocks, it does suggest that they’re losing patience with high valuations. 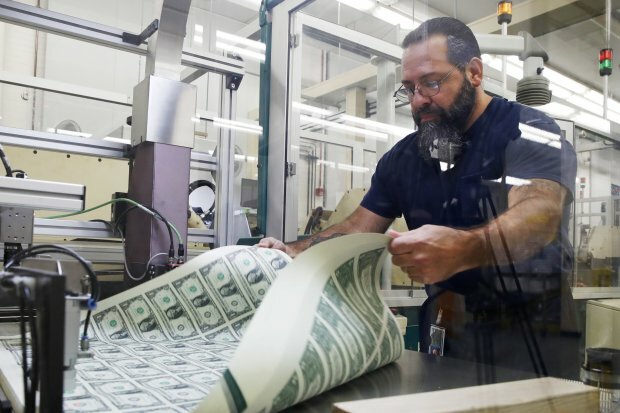 “If the market gets out of its Goldilocks stage and the economy gets hotter, or the markets get colder—either way, value will work,” says Scott Opsal, research director at Leuthold Group. No one expects the “value premium”—the extra returns typically ascribed to buying stocks cheaply—to disappear. But Kadnar says he doesn’t think the value factor can deliver the historical four-percentage point outperformance over the S&P 500 that it has historically. Though cheaper than the market, value isn’t nearly as inexpensive as in 2000. 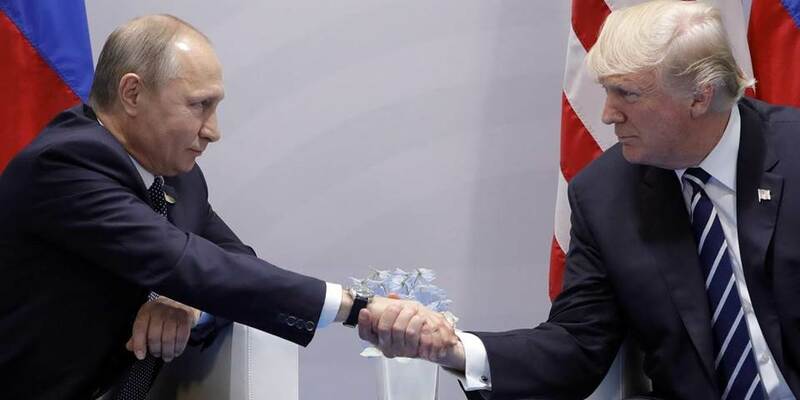 STOCKHOLM – In an age defined by US President Donald Trump’s rage, Russian President Vladimir Putin’s revisionism, and Chinese President Xi Jinping’s unbridled ambition, the international order is becoming increasingly disorderly, dysfunctional, and even dangerous. How did we arrive at this state of affairs? And how can we leave it behind? Until recently, the era following World War II was a time of benevolent liberal internationalism. The postwar order had begun to take shape as early as 1941, when US President Franklin D. Roosevelt and British Prime Minister Winston Churchill drafted the Atlantic Charter on a ship anchored in Canada’s Placentia Bay. Though Hitler had been victorious on the battlefields of Europe, Churchill and Roosevelt were determined not only to defeat the Nazi onslaught, but also to lay the groundwork for a future of peace and democracy. They succeeded beyond what they probably imagined was possible. After the Atlantic Charter came the United Nations, the Bretton Woods institutions, the global trade system, the Universal Declaration of Human Rights, and much more. During the postwar decades of decolonization, many new countries emerged, and former enemies united under new alliances and an overarching structure of integration. China’s great “opening up” and the Soviet Union’s collapse in 1991 marked the start of a quarter-century of truly remarkable global progress. In fact, judging by standard economic, political, and social indicators, it might well have been the best quarter-century in human history. There were no major wars between superpowers, global trade expanded and drove economic growth, poverty was more than halved, and rapid advances in science and technology delivered benefits to every corner of the world. In recent years, however, the world has entered a new phase. The politics of idealism and hope have been replaced by the politics of identity and fear. This trend took root in one Western country after another, but its most notable manifestations have been in the two Anglo-Saxon countries that made the previous period of miraculous progress possible in the first place. Today, the confused political debates in the United Kingdom are tragic to behold. Since the June 2016 Brexit referendum, Britain has searched in vain for an illusory concept of sovereignty that might prevent the massive loss of international power and influence that awaits it after its departure from the European Union. The kind of global statesmanship that the UK once offered the world has given way to parochial bickering. But the confused politics of Trump’s White House are of even greater consequence. For decades, the White House was a font of global leadership; today, it is a source of belligerent rhetoric that does not even pay lip service to the idea of a global order. Indeed, the Trump administration’s official National Security Strategy portrays US efforts to safeguard the global order as counterproductive and self-defeating. The future it envisions will be defined wholly by conflicts between sovereign countries. Revisions to America’s strategic posture would be a reasonable response to Russian aggression and rule-breaking, particularly in Eastern Europe, and to China’s growing assertiveness on the world stage. But the US president’s first instinct should be to defend the international order against rising threats, while making adjustments to account for new realities. Addressing climate change, increased migration, and the revolution in information and communication technologies (ICT) will require new, comprehensive international agreements to protect the interests of sovereign countries. Sadly, the pronouncements from Trump’s White House seem to be aimed at undermining any sense of order, with the hope that the US will come out on top in some future Hobbesian struggle for total global dominance. By this logic, international trade should be regulated not by rules and institutions, but through unilateral protectionist measures and arm-twisting. And institutions like the EU – which aims to ensure order and stability through integration – are treated with indifference, if not disdain. From China’s perspective, the Trump administration’s Hobbesian vision could prove appealing, provided that its economy continues to grow, and that it avoids serious domestic social or political upheaval. After all, with fewer global rules, China will face even fewer obstacles when asserting its growing influence abroad. In this scenario, the loser would undoubtedly be the wider West, meaning not just Europe but countries like India, which will remain committed to liberal democracy, economic openness, and the values underpinning that miraculous quarter-century after the Cold War. Even barring worst-case scenarios, the West will be facing a new world with new aspirants making new demands about the future. It would thus be a fateful mistake for Western powers to abandon the ideas and institutions that delivered prosperity and stability in previous decades. Above all, the two countries most responsible for creating the postwar international order must not turn their backs on it now. Was it just a mirage? The stronger, more synchronized growth in the world economy that powered markets in 2017 has faltered at the start of 2018. As that has become ever clearer in recent weeks, the U.S. dollar has rebounded suddenly and surprisingly. The uncomfortable reality is that economic, financial and monetary-policy cycles are in very different places around the world. On the growth side, Wednesday’s first-quarter eurozone gross domestic product data confirmed a slowdown, with annualized expansion falling to 1.7% from 2.7% in the fourth quarter, well below the 2.3% pace recorded by the U.S. Emerging-market growth appears to have softened too, early in 2018. The expectation last year that global central banks were all moving toward ending their extraordinary monetary policy may be proven premature. With U.S. inflation perking up, the Federal Reserve appears to be the only central bank pursuing that path, although it isn’t expected to move on Wednesday. Others are looking more hesitant. The Bank of Japan has abandoned its attempt to predict when inflation will reach 2%. In the U.K., weak data has led analysts to abandon the belief that the Bank of England will raise rates next week. And the European Central Bank is still waiting for signs of sustained inflation; some analysts are starting to wonder if the exit from bond purchases might not come in 2018 after all. Global interest rates are diverging further, rather than converging. Remarkably, the two-year U.S. Treasury yield is well above that on 30-year bonds in Germany, the U.K. and Japan. The gap between 10-year U.S. and German yields has reached its widest in 29 years. As long as there was a belief in the accelerating global growth story, investors confidently made trades like betting on a rise in the euro against the dollar. That trade got crowded, leading to the rapid, painful rebound in the dollar in the past month. The future of global growth has got harder to read as well. Bad weather may have caused the slowdown in Europe, for example. What has become clear is that growth and inflation will remain on track in the U.S. That will force investors to focus on continued tightening by the Fed. The concern is that monetary policy will be tightened too much, ending a long-running U.S. expansion, even before other central banks have really got off the launchpad. The more worrying scenario is if last year’s synchronization was more a matter of the economic stars aligning briefly, with faster growth masking the differences between regions of the world. 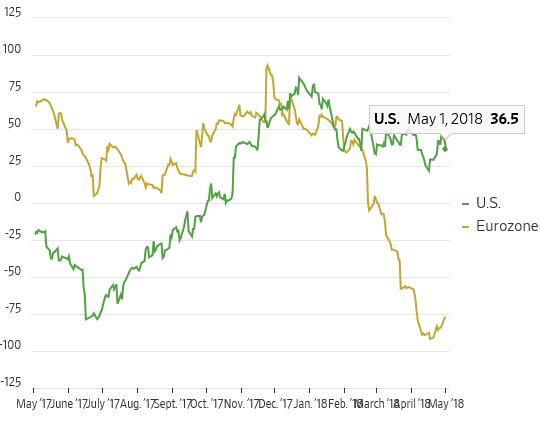 If U.S. growth continues to diverge from elsewhere, then U.S. bond yields might rise further, and the dollar could gain more ground. The global growth consensus—and popular trades based on it, such as emerging-market stocks and bonds—would face a challenge. He also says nation states are going out of business. I recently called him up to get an update on where we are today… and what to expect going forward. Justin: So, Doug. Are nation states really in decline? Doug: They’re definitely in decline, and that’s a good thing—nothing to be concerned about. It’s cause for optimism. The question is why are they falling apart? Some background. The concept of the nation state came about with the Treaty of Westphalia in 1648, something that everybody only vaguely remembers from a college history class. Actually, today’s students will probably never even hear of it. That class has likely been replaced with Gender Studies or Black History. Why was it so important? It redirected the concept of “loyalty” away from an individual—a prince or a king—to the State itself. A geographical area now wasn’t so much the possession of a ruler, as a possession of a State. This really got the concept of nationalism going; nationalism is just tribalism writ large. That’s how the concept was born. But the idea of a nation state is coming to an end. Now almost anybody can go almost anywhere thanks to jet travel; you’re no longer married to one place, like a medieval serf. And you can communicate with anybody anywhere on the planet thanks to the Internet; that makes it much harder to keep all the sheep thinking the same thing. So, first, people realized that it’s completely ridiculous and dysfunctional to be loyal to some thug who, through an accident of birth or through military competence, set himself up as a prince. Now they’re discovering that it’s equally stupid to be loyal to a government that’s running a country. Justin: What should be people be loyal to instead? Doug: Your loyalty should be to people who share your values or philosophy on life. Whatever is important to you. That could be any of a thousand things, including your religion or occupation. Or maybe just a hobby. The nation state is now an anachronism, and going out of business. It’s dysfunctional, destructive, and serves less and less of a useful purpose. All it does is tax, regulate, persecute, and conduct wars. People got a bit of a scare a couple weeks ago when it looked like the US might start a nuclear war with the North Koreans, or the Russians. Perhaps they’ll threaten China next. That’s all State-on-State action. Every government on the planet wants to maintain its power, and fights against losing power. We saw that recently with Spain and Catalonia. We’re seeing that with Syria, which should be several different entities, probably based on religion. A few years ago in the Central African Republic, where the Christians and the Muslims were hacking each other up with machetes for control of the government. Incidentally, I was headed there from Paris just then, and it was simply impossible. It’s not even a real country. If even 1% of Americans—in fact anyone on the planet—has even heard of the place, I’d be surprised. But it’s a nation state, with equal voting rights with the US and China in the UN. This will happen all over the Third World. Every one of these so-called countries are completely arbitrary and artificial constructs. And they’re all bankrupt. Including the US. Justin: I agree that the idea of a nation state is completely obsolete. But, as you know, governments are becoming more intrusive and controlling. Doesn’t that support the idea that nation states are getting more powerful, not weaker? Doug: Absolutely. In every country, citizens have much less freedom than they did 100 years ago. The number of laws and regulations has exploded. Equally bad, the income tax is everywhere—it didn’t exist almost anywhere before the 19th century. Even worse, money everywhere is now just a fiction. Before the early 20th century money was completely international. It was gold, which was accepted everywhere. And in those days you didn’t need a passport—just enough money to travel and maintain yourself. The standard of living was lower in those days. But things have improved because of technology, despite government draining capital away from enterprises, and misallocating it for political purposes. Technology has advanced tremendously over the last hundred years. But a lot of people conflate the increase in standards of living with the growth of governments. Governments have grown not because they created new wealth, but because they’ve confiscated wealth and used it against their subjects. But now most of them are bankrupt—even though they’ve taken taxes from trivial levels to monstrous levels. Even with the huge additional amounts they’ve stolen by inflating their currencies, they’re still bankrupt. I suspect we’re reaching the end game—but that’s another story. So, you’re right. Freedom has been in decline throughout the world. I mean you can’t even arm yourself today without getting permission from the State. And, historically, a major sign of a free man was his right to be armed. Snowflakes, cupcakes, and SJWs are afraid to be armed; they have a slave mentality. It’s disturbing and the situation is getting worse; this is all going to come apart. We’re going to have a crisis that reconstitutes everything in a new form. The US peaked in the ’50s, has been in decline since the ’70s, and its descent is accelerating. Actually, Western Civilization peaked just before World War One, and it’s in even bigger trouble. That’s a real tragedy, since about 98% of everything of value in the world is a product of it. Justin: What kind of crisis will be the final nail in the coffin for the nation state? A currency crisis? A debt implosion? Possibly a war? Doug: The next major crisis will be monetary in nature, thanks to central banks. Again, only a few central banks even existed 100 years ago. They simply weren’t necessary, because everyone used commodity money. And commercial banks operated on sound classical principles. It’s a different story these days. Central banks and commercial banks are essentially Ponzi schemes, and engines of inflation. It’s a major reason the rich are getting richer—which is OK, except that today it’s at the expense of the middle class. This is all going to blow up. And the next crisis will be one for the record books. It will start as a monetary crisis, but will turn into an economic, political, social, and military crisis. You can be sure the US Government will be involved in everything, dragging its subjects with it, like it or not. Justin: Who’s going to lose the most when this crisis hits? Doug: Well, wealth has been funneled towards the people in control, the elite. So, the little guy is probably going to get hurt the most. His savings will evaporate because it’s mostly in paper currency. But there could come a time when the government eats the rich, too. Those people profited from the system. And maybe they deserve it. At least the ones who ride the Metroliner between Washington and New York. This is because the U.S. empire is in rapid decline. It’s similar to the fall of the Roman Empire. Although the Athenian Empire is probably an even better analogy. We’ll have to discuss that one of these days. Justin: How might the United States react militarily? Doug: Well, the declining U.S. Empire will likely confront the rising Chinese Empire. The US still has a very powerful military. The chances are it will use it while it’s still on top. Or a small war could break out anywhere in the world, and escalate. Things could get out of control very quickly. Remember, Black Swans aren’t things you don’t expect. They’re things that you don’t know even exist. You’ve also got to remember that the U.S. also has a genuine demographic problem. This wasn’t an issue one hundred or even fifty years ago when most of the U.S. population was of European and Christian descent. Today, it’s very different. A huge portion of the population is Hispanic. And these recent migrants have much different traditions. They don’t have traditional American values. That’s even more true of other migrants. The US is importing migrants from all around the world. These people have totally different philosophical, religious, and racial backgrounds. They just don't fit in. It’s perhaps like Rome after Adrianople in 378; once the gates were open, within a generation—30 years—the barbarians had total control of the old empire. Now, I’ll say that it’s fine when you add a few outsiders to a society. They add some spice to the stew. But it’s a formula for chaos when they arrive in massive numbers. And are doing so at the expense of the natives. This is one reason I suspect that the U.S. won’t exist one hundred years from now. It will break up into different regions. The same thing will happen in Russia, Africa, and many South American countries. For example, there’s no reason why Brazil should be one country. Bolivia will break up into two, possibly three countries. (CNBC) – Homebuyers, hold onto your wallets. The gains in home prices are getting bigger as the supply of homes for sale gets leaner. The median price of a home sold in March surged 8.9 percent compared with March 2017, according to Redfin, a real estate brokerage. It is the biggest annual increase in four years. Redfin tracks prices in 174 local markets and calculated the median home price at $297,000. High prices are the result of very, very low inventory. The supply of homes for sale was down 11.9 percent in March, compared with a year ago. As a result, sales fell 3.7 percent. The number of new listings in March dropped 5.6 percent annually, although part of that may have been due to the Easter holiday falling early this year. Buyer demand is still strong, despite higher prices. Sellers are pulling back, however, likely worried they won’t be able to find anything else they like or can afford. The average home went under contract in 43 days in March, more than a week faster compared with a year ago and a March record. Nearly a quarter of the homes sold for more than their list prices. Large metropolitan markets in California, as well as Seattle and Denver, continue to see big price gains, but some unexpected markets are also seeing inflation, as well. Markets like Allentown, Pennsylvania (21.8 percent), Detroit (20.6 percent) and Las Vegas (16.5 percent) are not far behind. The supply situation is acute in Washington, D.C., where inventory fell 22 percent in March annually, according to Long & Foster Real Estate. It would take just 1.8 months at the current sales pace to exhaust the supply. A balanced market supply is considered to be about six months. Another reason for low inventory might be that people who move run the numbers and discover that it’s profitable to hang on to their first house and rent it out. Combine their low-rate mortgage and high current rental rates and that’s the best-cash flow generator they have access to. (CNBC) – Demand for gasoline hit a record level at 9.86 million barrels a day last week, according to government data. Prices at the pump are expected to top $3 a gallon for unleaded gasoline in many parts of the country in the next few weeks, as summer driving season approaches. For a national average price, “I think probably it’s a better than 50/50 chance that the U.S. surpasses $2.80 as an average,” Kloza said. The national average for unleaded gasoline was $2.73 per gallon Wednesday, up a penny from Tuesday but seven cents higher than last week, according to AAA. 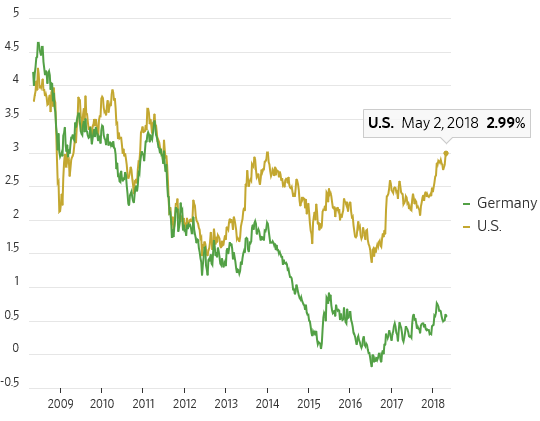 Gasoline prices have been moving up steadily with the price of oil, and are now up 33 cents from last year’s levels and almost 20 cents from just a month ago, according to AAA data. Kloza notes the previous high for demand was just over 9.8 million barrels per day last summer, noting there has never been a number that high before Memorial Day. Spiking home prices are a mixed bag, with current homeowners benefitting at the expense of wannabe homeowners. But spiking oil and gas are bad for almost everyone. US automakers depend on sales of monster trucks and SUVs, which will be far less attractive in a $3 gas world. And anyone who commutes gets, in effect, a tax increase. Meanwhile, both houses and gas feed the Fed’s desire to “normalize” interest rates at considerably higher levels, a process already well under way. Here’s the 10-year Treasury yield so far in 2018. Note the spike in just the past couple of days. There’s a number on the 10-year that will destabilize the financial system, but no one knows what it is. If it’s 5% we have some breathing room. If it’s 3%, not so much.